I once saw a segment on the Martha Stewart show where she had a guest on and they were making pastrami sandwiches. In her typical, incredulous, Martha-tone, she said, “Doesn’t everyone corn their own beef? !” I balked. I would have asked, “Does anyone make their own corned beef? !” Making my own corned beef seemed not only like a giant waste of time, but I don’t even crave the stuff, so why would I want to let a gigantic stock pot filled with a brisket sit in my fridge for a week when I could go buy a nice, pre-packaged Hormel version for $4? Because I’m married to Matt Palmer. He is extraordinary. He always sees the potential in a long process. He has endless patience. He can set out with the process in mind, not the finished product. He enjoys learning how to do something from scratch, whether it be something widely appealing like home cured bacon, or as unappealing and death-smelling as pickled diakon, which sat on top of my computer for a week, fermenting (but hey, it made an interesting dip!) The point, for him, is always the learning process. I have learned so much in the last 9 years of knowing him and 8 years living with him. He’s never once lost his patience and thrown something against the sink to watch it explode because it didn’t work out right (ahem), and even spent one Sunday afternoon making homemade mayonnaise 5 times in a row for 2 hours because the emulsion kept breaking (I remember crying that day.) Needless to say, he’s greatly influenced where I am now and how cooking has become therapeutic for me. He is the reason I keep trying to do things better, for better’s sake. So when he got me involved in his latest corned beef endeavor, I was less reluctant. He got it in the brine, and I finished it on the stove a week later when it was ready. It makes a TON, so I will be slicing it and freezing it really soon. But the other day, I sliced some thin strips, heated them up in a skillet (unnecessary, because it’s cooked, but appealing because it sizzles) and made a corned beef sandwich on rye with store-bought sauerkraut that was fermented in someone ELSE’S place of business instead of my garage, thankyouverymuch. The results were good. I’ve taken the corned beef recipe directly from Michael Ruhlman’s blog, because that’s who we look to when it comes to charcuterie recipes and we didn’t deviate from the recipe a bit. 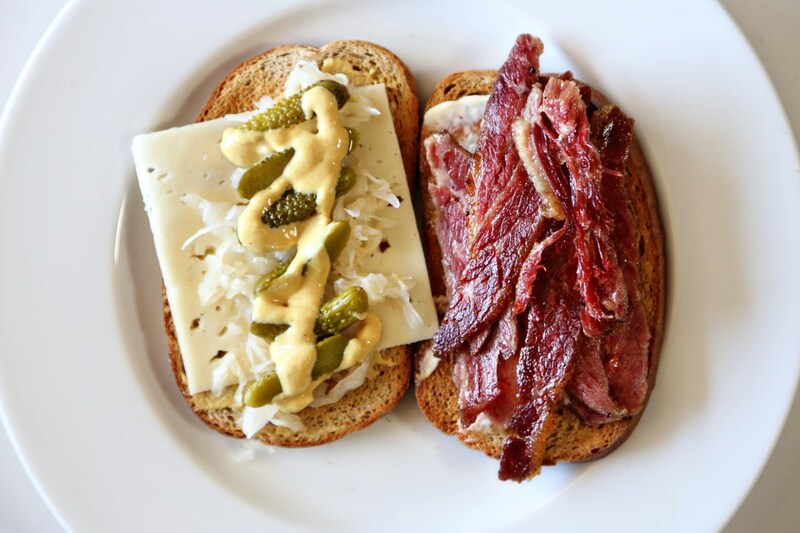 For the sandwich, I just toasted some rye bread, spread mayo and dijon mustard on each side, topped it with sliced cornichons and sauerkraut and melted some swiss cheese on top of the beef. 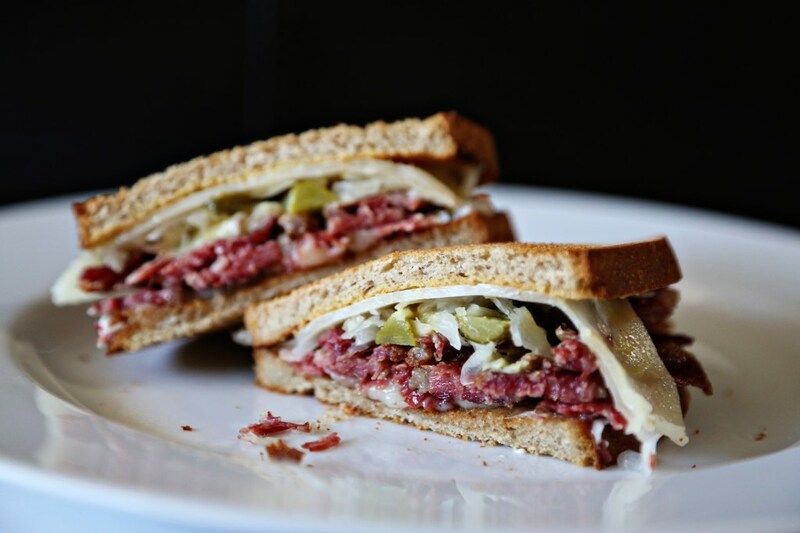 This entry was posted in Monday Meals, Uncategorized and tagged corned beef, DIY, Ruhlman, sandwiches. Bookmark the permalink. This makes my mouth water. I was craving duck confit tonight, but I opted for salty roasted pork belly instead. I’ve been in a charcuterie frame of mind lately.